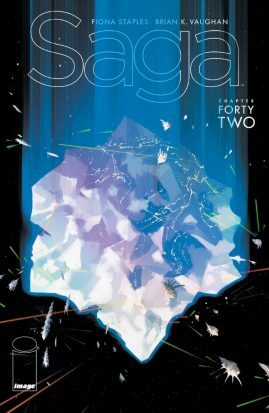 I complained in my most recent review of Saga for this column that issue #40 had too many scene changes with too little action, with the latter being the major flaw of the issue. What I wouldn’t give to go back. This issue also travels to and fro across the universe, checking in with nearly all of our major characters, and, in most cases, brutally changing the narrative landscape of each. As fitting an end to an arc on war as I’ve ever experienced, its relentless doling out of tragedy reminds me of the montages capping off films like The Godfather or Elizabeth. Three issues ago, two characters discussed the tentative possibility of heaven. In this one, two characters discuss the inevitability of hell. Cake is served in opulence as images of war flicker inertly on screens. An execution is stalled and faith is renegotiated. Loyalty means nothing in the face of new danger. A colossus screams. The people scream until they can’t. A child is lost, then another. What will they unearth next? Of my almost lifetime as a fan of He-Man I would have never know that there was a daily newspaper strip documenting the trials and tribulations of the hero of Eternia and his friends, families and enemies. There have been various comic books, and of course there were illustrated picture books and those little comics that came packaged with the action figures back in the day, but newspaper strips? Why weren’t these in the Bergen Record, or even the Daily News which had the more fun strips like Spider-Man? According to the intro of this wonderful collection assembled by a small team and brought to us by Dark Horse Comics, it was because the strip thrived mainly in other countries for most of its four and a half year run. This team had to scour the internet, the library of congress, the records of The Los Angeles Heral Examiner and the world at large for these newspaper strips. It was published in India, Brazil and Serbia, among other countries. It really speaks to the phenomena that was He-Man in the 80s that the influence of this brand was so widespread. Does it hold up? Mostly, in ways that I feel other media featuring He-Man doesn’t. For starters, Masters of the Universe is an odd property, which is why more recent revivals of it haven’t held up. On the one hand it’s a fun blend of Fantasy and Science Fiction, magic and lasers. On the other hand it was originally conceived as a means to sell toys, at a time when Star Wars and Conan the Barbarian were massive movie properties. Legend has it that the toy line originally was supposed to be for the original Conan the Barbarian movie, until Mattel realized how adult that movie was. With that in mind, the cartoons and little comics provided little in the way of a foundation to base an ongoing series off of, be it comic books or a newspaper strip. That said, this isn’t sophisticated reading. It’s not a jab against primary writer Chris Weber though, he took what he had and made a stew out of it. Having read a chunk of the original comic books based off Star Trek and Star Wars, I will actually say that this does a better job running with the source material. Usually a central threat occupies the strip for about four weeks, He-Man and his crew defeats it, and then another threat arises in the next month. Many of the wonderful, colorful, horrible and wacky cast of characters pop up in every story, and characterization is very consistent with the popular cartoon. Skeletor is a mischievous bumbler with a love of calling his henchman negative alliterations like “Simpering serpents”, and cursing with phrases like “By the bones of my maiden aunt”. He-Man says dumb one-liners while he single-handedly kicks the bad guy’s butts. Man-At-Arms delivers exposition. The henchmen of Skeletor and Hordak are indeed mostly fools. One thing I must also give Dark Horse credit for is keeping the blemishes of the coloring and artwork from the original source material. I notice with a lot of trade paperback collections that when they try to digitally clean up the color and art from the originals that it’s often too bold, and many details are lost in translation. These were meant to be a quick and fun escapist trip in the pages of a newspaper, and in publishing this collection the experience should be taken in as it was originally meant to be. This is a great collection for children, and I would highly recommend it, as well as for fans of Masters of the Universe. You can’t go wrong with this deeper look into the universe of He-Man. These comics also benefit from being released later in the release cycle of the He-Man toys, so for diehard fans there are even appearances by characters like King Hiss, Scare Glow and Ninjor, who did not really make any appearances in the original cartoon. 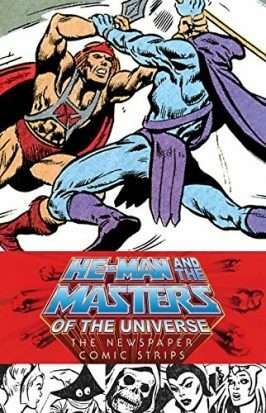 Like the wonderful Art of He-Man and the Masters of the Universe book that was released by Dark Horse in 2015 this book fills out the spaces and does right by what could have been the grand mythos of Masters of the Universe. Due to declining sales in the later 80s and a failed live action movie the entire Masters of the Universe brand was put to rest for many years, with a short revival in the early 2000s. While a new storytelling medium for these characters really hasn’t taken hold in recent years I still have hope that this is not the last time we are taken into the depths of Castle Grayskull. Until then, it’s a wonderful service being provided by Dark Horse Comics in publishing these lost treasures. The Spirit has a helluva pedigree. Will Eisner, Jack Cole, Wally Wood, Joe Kubert, Alan Moore, Dave Gibbons, Neil Gaiman, Paul Pope, Mark Evainier, Sergio Aragones, Paul Smith, Matt Wagner, Dan Schkade, Darwyn Cooke and a host of other artists all worked on Eisner’s signature masked do-gooder. He’s something of a comics Holy Grail. Since Will Eisner was able to retain the copyright to the Spirit, Denny Colt and company never became corporate owned franchises like his Golden Age contemporaries – Superman, Batman, Wonder Woman and Captain America. Eisner had control over the character throughout his life and since his death, a select few artists have worked on the character. Francesco Francavilla is the latest stellar artist to weave a Spirit tale. The first page is a touching tribute to Will Eisner and Darwyn Cooke’s. It’s a beautiful silhouette of The Spirit in a rainy graveyard. Cooke wrote and drew an award winning run of Spirit comics over at DC Comics in 2007-2008 and introduced the character to a whole new generation of readers. Francavilla’s choice to open his series with this is a somber reminder of how lucky we as comic fans are. Francavilla immediately sets up his story’s theme in an ominous message: “No matter what, the past will always catch up with you.” Francavilla then begins his Spirit story. A homeless man comes back to find his friend dead. This moves right to an Eisner inspired double page splash title. This comic feels like a Will Eisner Spirit comic channeled through Francavilla’s unique aesthetic. Hot damn, this is one gorgeous comic! The story focuses on the Spirit’s taxi-driving partner, Ebony White. Ebony’s cousin Vince is back in town and they have some dinner, reminiscing about the old days. As they part ways, Vince encounters a dastardly face from his past. Meanwhile, some shadowy figures lurk about the alleys of Central City, taking corpses for some unknown and most likely nefarious deeds. 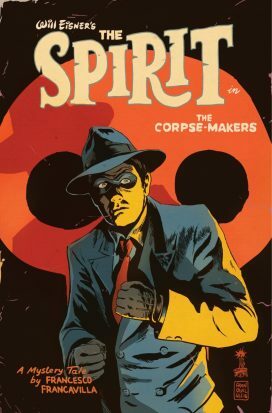 The Spirit: The Corpse Makers # 1 has all the makings of a great Spirit yarn. There’s crime, there’s adventure and a whole lot of mysterious goings on. As much as I love Afterlife With Archie, I’m willing to deal with it’s delay if Francavilla’s giving us an awesome Spirit comic!